We were approached by Liverpool Institute for Performing Arts Sixth Form College in their look for a new PA system for their Sixth Form campus both as an audio install and portable system. The Sixth Form campus has a recently built drama studio/theatre alongside a number of music practice rooms, recording studios and dance studios. Mike Roberts approached us in their hunt for a suitable sound system for use in the theatre and around the building for other distributed performances. The theatre hosts a number of productions ranging across the performing arts including live concerts and theatre productions. 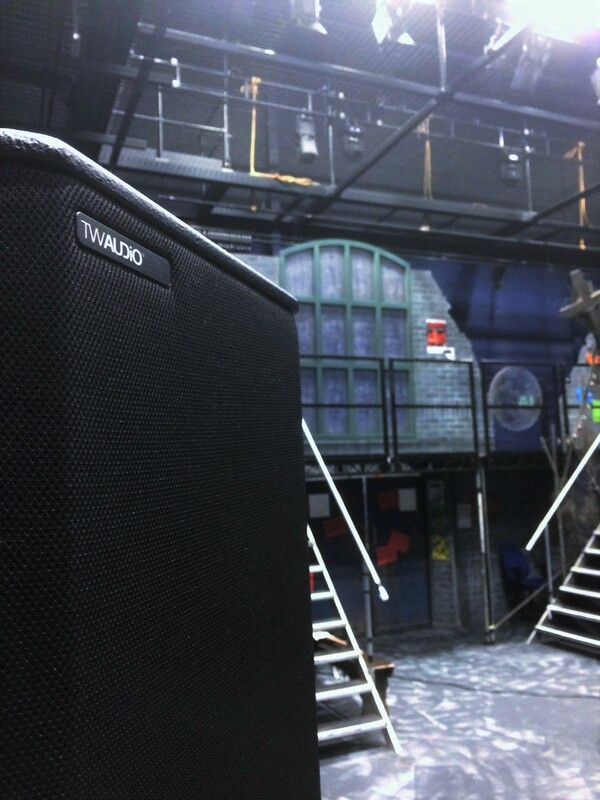 We opted to take a large number of point source TW AUDiO (www.twaudio.de) speakers into LIPA to show the systems available as we felt this would be the most suitable and best supported system for their needs. Originally there were 2 key factors of consideration; a portable system capable of good quality audio reproduction to be moved around the site as well as use in the theatre, and a fixed venue system for vocal and track playback for the theatre but suitable for both standard theatre seating as well as thrust staging or theatre in the round seating format. To accomplish this, the system needed to not obstruct the space (so needed to be flown high) but also be audibly clear to the audience areas. As part of the demonstration, the M-series speakers were the primary on display ranging from the 6″ M6 speaker up to the 15″ M15 box. Alongside this we also showed the B-series low frequency speakers and the smallest of the C-series (coaxial) of the C5. The venue specific installation system was designed around the C5. The surprisingly powerful box provided the crystal clear sound and high quality stereo imaging alongside a small format box was ideal for the venue. A square consisting of 8 speakers hung directly underneath the wire suspension grid was designed (2 per side) to provide a stereo image in all 4 directions, but allowing each side to be turned off as needed, creating an easily configured install. The dispersion would provide great coverage of the seating area and when backed up with some B10 subs would provide a perfect low profile system. Unfortunately, the original specification for a flexible audio installation in the theatre changed after the demo day as the venue opted to install raked seating for use in the venue and the portable system turned out to be one of the best solutions for this. The system chosen for the portable PA was the PA-SYS-TWO consisting of 2 M12 boxes and 2 B30 boxes driven off the SYSRACK-K3 consisting of 2 Powersoft K3 amplifiers. This was supplied with wheelboards and covers for all speakers for portability. The lightweight Neodymium drivers meant the system can easily be moved and setup by one person and is serving as an excellent portable system for the campus. This system was also adopted for use as the replacement audio installation for the main theatre after the change of seating arrangement.